The greenery glistens beautifully in the rain. Kenroku-en is not the only Japanese garden in Kanazawa. 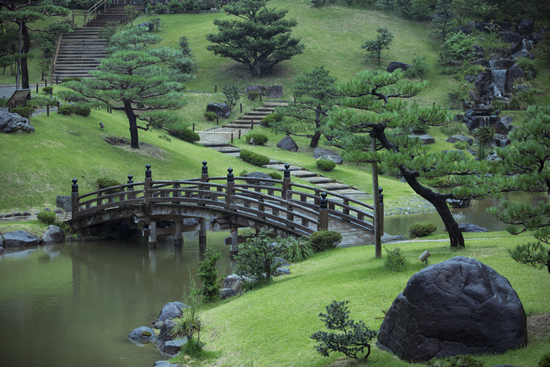 Kanazawa's most famous garden is Kenroku-en, one of the three great gardens of Japan. 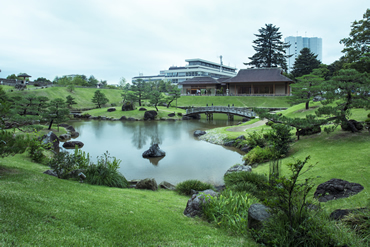 However, the city has other splendid Japanese gardens too. When the drizzle is falling, or when the rain has stopped, why not enjoy visiting these gardens? Wet with rain, the greenery deepens, and you can appreciate the scenery in a way that isn’t possible on a fine day. 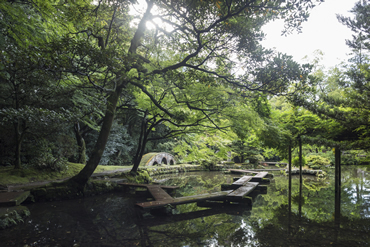 From its construction by Toshitsune Maeda, the third lord of the Kaga Domain, to the abolition of the feudal system, the garden was loved by all the generations of the Maeda clan. It was reconstructed in 2015. The work was completed after a five-year excavation survey and the study of detailed illustrations from the late Edo period. 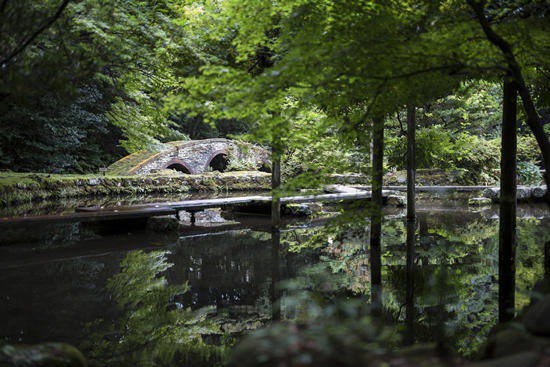 The garden features a path around a pond and a three-dimensional construction, with a height from the bottom of the pond to the top of the surrounding stone of 22 meters. You can enjoy a variety of expressions by viewing the garden from different locations. The garden is illuminated on weekend nights, and has special light shows which change with the seasons. Be sure to check the schedule on the garden website. 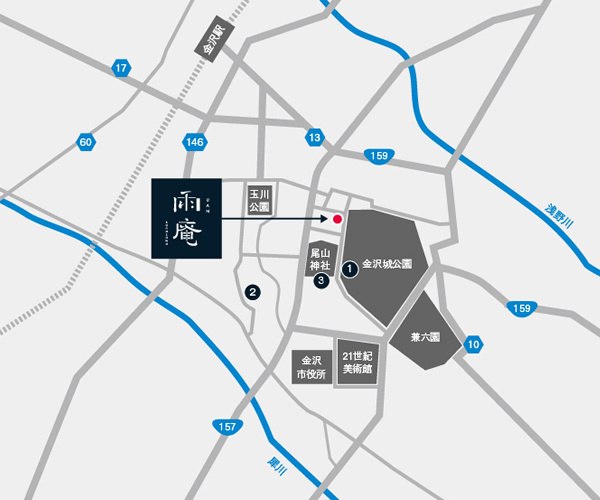 From the time Toshiie Maeda entered Kanazawa Castle in 1583, eleven generations of the Nomura family held senior posts in the service of the lords. 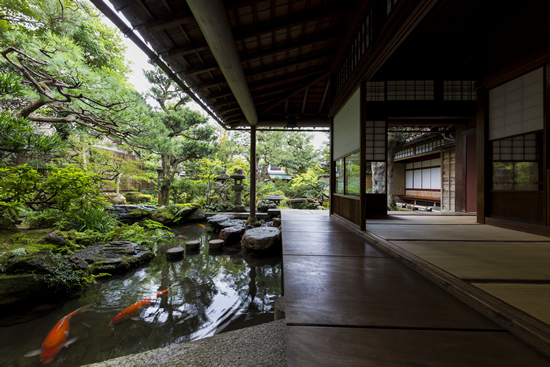 Part of a house built for a Kitamaebune shipping merchant was reassembled on the ruins of the Nomura family residence, and it is now open to the public. The residence has stunning architectural value, with a splendid all-cypress coffered ceiling and sliding doors containing glass, but the garden, which harmonizes beautifully with the residence and has a meandering stream below open veranda, is a must-see. With its 400-year-old red bayberry tree, old chinquapin tree, exquisite stones and strangely shaped rocks, the garden is rated highly, and has previously been ranked third among Japanese gardens by the American Journal of Japanese Gardening. Despite being part of a shrine, the main gate contains Western-style stained glass. For this reason it draws attention and is often photographed. However, this shrine also contains a stunning garden. Before the shrine was built in 1873, the Kanayagoten villa of the Kaga feudal lord stood on the site. 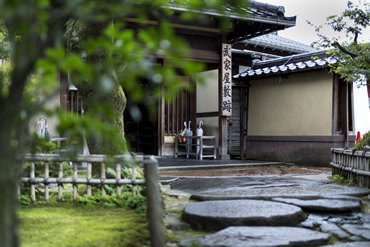 It is said that the current garden was constructed before the shrine was built. The garden was created in the shape of traditional Japanese musical instruments, and you can enjoy trying to find the location of the shapes of the koto harp, the sho wind instrument, the biwa lute, and others.